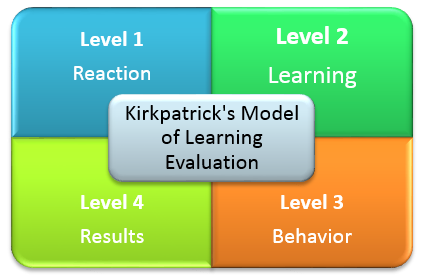 In my previous blog, I presented a brief introduction to the Kirkpatrick’s Model of Evaluation and its impact on training. This blog will talk about the model in more detail. According to Dr. Don Kirkpatrick, there are four levels of evaluation of any training program. This is the most basic level of evaluating a training program, wherein learners who have completed a training program are asked for inputs regarding how they liked the program, how they liked the training venue, the ease of participation in the program, if the trainer was good, about their overall experience of the program, and the like. Most organizations do not evaluate the success of their training program; but whether they realize it or not – this first level of evaluation is always carried out, with bosses or managers informally asking their employees as they walk out of a classroom session, “how did it go?” This off-hand question invites very honest answers such as, “Too long,” or “The air conditioner was not working,” or “Very exciting and informative”. A formal way of evaluating training at the Reaction level is to get employees to fill out a questionnaire, feedback form, survey, or even an interview after completing the training program. All these are inexpensive and quick ways to gather immediate responses and determine if the training program was worth the investment – and more importantly – if it was accepted well by employees. This is when it gets a bit more serious.This level measures the degree to which employees acquire the intended knowledge, skills, attitude, confidence and/or commitment. As you can see, we now move from a superficial level of understanding the success of a training program, to a deeper level of understanding the extent of learning that has taken place, based on the employee’s participation in the program. This can be done by observation, assessments, simulations, exercises, demonstration of skills, and skill practices. Observation, on-the-job testing, assessments conducted at regular intervals (immediately after training, a month after training, six months after training, a year after training), appraisals by the employees themselves (as well as their managers), are all ways that can be used to measure behavioral changes. This is considered the most important of all four levels, because this level measures the impact of training on business. At the end of the day, the final goal of any training program is to provide healthy business benefits and results. So this is not measured at an individual level or a department level, but at an organizational level. What I have presented here is the model in its very basic form. When each of these levels is examined individually, you will find that there is scope for deeper and more refined evaluation of a training program at each level. There is also scope to find loopholes in each of these levels – although these are few and far between. We will discuss this and more in the third part of this Kirkpatrick series.